Earthquakes have always been part of Los Angeles' past  and its future. 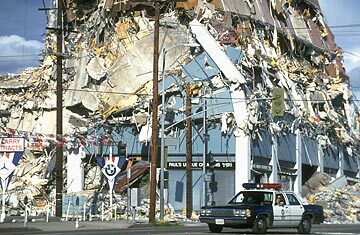 In 1994 a 6.7-magnitude quake hit the Northridge area of the city, badly damaging freeways, killing more than 70 people and causing $20 billion in damages. But those numbers could be dwarfed by a major quake in the future. The geologic record indicates that huge quakes occur roughly every 150 years in the region  Los Angeles lies along the southern end of the San Andreas Fault  and the last big quake, which registered a magnitude 7.9, happened in 1857. Los Angeles has done a lot to beef up its building codes and emergency response in the 15 years since the Northridge quake and may be better prepared than any other major U.S. city, but its sheer size ensures that the next Big One will be bloody. See pictures of Los Angeles.